What Is DA Form 7574-1? DA Form 7574-1, Military Physician's Statement of Soldier's Incapacitation/Fitness For Duty is a form used for documenting a military physician's conclusions regarding either the ability or inability of a service member to perform their duties. A new version of the document - sometimes incorrectly referred to as the DD Form 7574-1 - was released by the Department of the Army (DA) in March 2008. An up-to-date DA Form 7574-1 fillable version is available for download below or can be found through the Army Publishing Directorate online library. The DA 7574-1 must be completed once every three months along with statements from employers regarding non-military employment status. Service members are discouraged from performing any military work until a determination of fitness for duty is made by a military physician. How To Fill Out Da Form 7574-1? For use of this form, see DA PAM 135-381; the proponent agency is DCS, G-1. This information will be used for the physician to verify eligibility for military duties. Notices apply to this system. IS FIT to perform military duties. IS FIT to perform civilian duties. b. Date of next follow-up appointment. 5. Rank -PVT, SPC, SSG, MSG, CW2, 2LT, CPT, LTC. c. Name of the military hospital where treatment is received. 6. Duty MOS/AOC - 75B, 76C, 71L/66H, 70B. d. Name of attending physician. e. Rank of attending physician, i.e. CPT, LTC, COL.
f. Daytime phone number of physician. g. Fax Number for attending physician. h. Signature of attending physician (see note *) . 8. INCAPACITATION FOR MILITARY DUTIES. physician to determine fitness for duty (year, month, day). Fitness for duty will be determined IAW AR 40-501.
b. Check appropriate box and complete date* if applicable. c. Check appropriate box if applicable. d. Check appropriate box and complete date if applicable. 9. INCAPACITATION FOR CIVILIAN JOB. military medical support office (MMSO) contracted physicians). b. Check appropriate box, complete date if applicable. contract to accept payment from TRICARE. The DA 7574-1 relates to the medical documentation pertaining to the treatment received by the soldier and should be completed when requesting incapacitation payments. The document contains two sections in total. Section I - Soldier Identification - is mostly self-explanatory. All boxes are completed by the soldier making the claim and require their personal identifying data. This information includes their name, SSN, rank, MI, duty MOS or AOC. This part should also identify the service member's civilian occupation with a copy of the job description attached to the completed form. Section II - Incapacitation/Fitness for Duty Verification - consists of two parts. A soldier's incapacitation to perform military duties must be verified by U.S. Government or military physician. Incapacitation for a civilian job can be verified by any licensed physician. All lines in Box 10 are completed by an attending government physician. Authorized personnel includes licensed government or military physicians, Reserve commissioned officers employed as licensed physicians by the Department of Veteran Affairs and non-military physicians employed by military services (DVA, TRICARE, MMSO). The required information includes the diagnosis and prognosis, the date of the next follow-up appointment along with the physician's personal data and their signature. 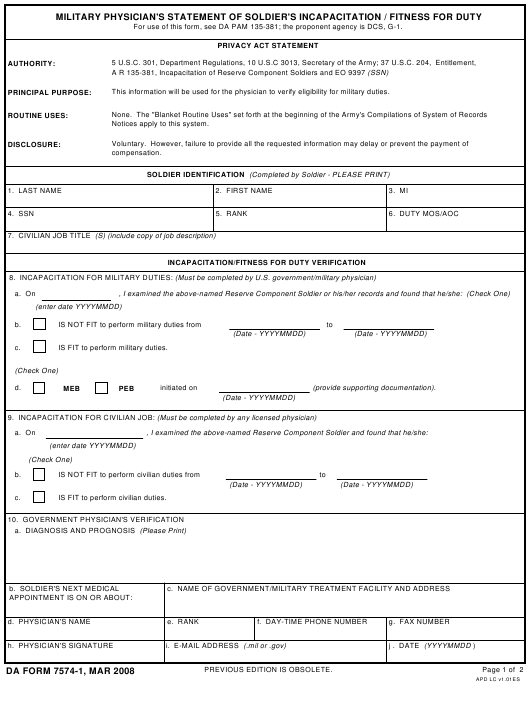 DA Form 7574, Incapacitation Pay Monthly Claim Form, used to determine the eligibility of the soldier to receive incapacitation pay. DA Form 7574-2, Soldier's Acknowledgement of Incapacitation Pay Counselling, by which the soldier testifies that they were properly informed on incapacitation pay claims.